We're expecting much from you in this issue of The Capital Minute. Just look at the article headlines: "Developing A Business Plan," "15 Steps to Starting Your Small Business," "How To Begin A Business Plan," and "The Visionary Entrepreneur." Yes, we do take business plans seriously. And, this month is no exception. First, we work on the necessary ingredients for a well-developed plan. In our Insights column on page 3, Dave Lavinsky of Growthink tells why you need to pick the right business, know your target market, and select the right industry and product. See why you need to think about the Internet, even if you don't plan to be online right away. Next, to write a successful plan, you need to know what it takes to start a business. That's why on page 4 we included "15 Easy Steps to Starting Your Small Business" by Eve Jackson, the owner of Details Small Business Solutions. Of course nothing is "easy" about starting a business, but you'll find the visibility from her steps most helpful. Moving on to the nuts and bolts. In our feature article, "How To 'Begin' A Business Plan," we take a good hard look at holding the interest of your reader from start to finish. And, it all starts with the first sentence you write. It is the one that determines whether your reader dips further into your plan or discards it into the wastebasket. So starting on page 7, you'll find some sample "openings" for your cover letters and business plan circulars. We round out this issue with an article on vision. In "The Visionary Entrepreneur" on page 12, Joe Love explains what it means to have a clear picture of what your business will look like and how it will work. What must your business look like, in order for it to give you the kind of life you desire? What will your business look like when it is finished? I hope you enjoy the issue. Please drop me a line and let me know what you think. 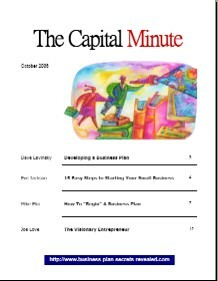 The Capital Minute: How to Begin a Business Plan.